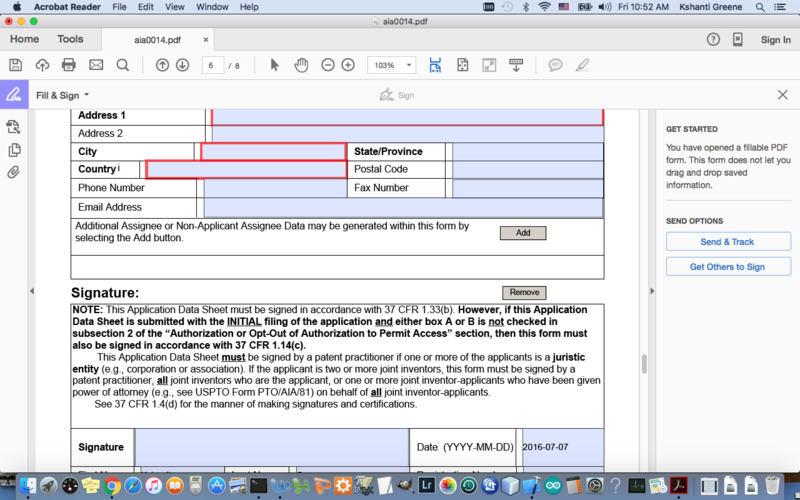 I am trying to sign the PDF form aia0014.pdf. It states that signing is enabled but placing saved content is not. I have downloaded both Adobe Reader 11 and Adobe Reader DC, but the sign tools are disabled. The aia0001 form worked fine. How can I sign this form without printing out, signing, and scanning, which I suspect is not acceptable? I use Nitro 5 PDF tool, downloaded free from Majorgeeks.com. It has a clickable menu that helps you select any area for text or adding images. That's how I signed these forms for electronic filing. My first provisional I typed in everything I could, printed the form, signed it, and scanned it for records and to make a copy for mailing. Not the answer you're looking for? Browse other questions tagged patent-applications forms or ask your own question.